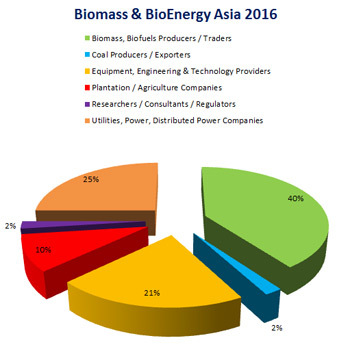 "Realizing New Energy from Biomass & Biogas"
Asia’s biomass market sets to grow in supply and utilization (demand). While Japan, is ramping up their imports for wood pellets for co-firing or dedicated biomass power plants, a significant scale-up in rest of Asia using domestic biomass resources are set to grow too. In Q4 2016, the Government of Indonesia issued a new regulation on the purchase of electricity by PLN from biomass and biogas power projects. This new regime affirms the country’s commitment to boost the development of electricity generation (e.g. 35 GW power program) and increase the share of renewables in the energy mix. A country well-endowed with extensive agricultural resources, from palm oil, sugar crops to woody biomass (rubber wood and etc), these biomass residues and wastes is ready thermal assets for energy generation. Including appropriate Feed-in tariffs (FiTs), a comprehensive and structured framework is essential to accelerate investment and development of biomass power, biogas and waste to energy (WtE) projects in Indonesia. On the other hands, the tougher biofuels mandates across Asia (Indonesia, Malaysia, China, India, Thailand and the Philippines) is driving a new wave of growth in biodiesel and ethanol production and trade. Against a background of competitive fossil oil price, how is Asia’s biomass and biofuels market going to shape up to stay competitive? For the biomass abundantly endowed countries in South East Asia, what are the key considerations when deciding between local utilization or export? Direct combustion, carbonization or biogas? Held in conjunction with Indonesia Renewable Power, key players and stakeholders in Asia biomass, bioenergy and waste-to-energy (WtE) will join us at CMT’s 3rd Biomass & BioEnergy Asia, in Jakarta to evaluate on the opportunities in biomass power, biogas and waste-to –energy, and provide much needed insight and analysis into FiT and financing for your projects. Sign up today with your team and enjoy attractive early bird and group discounts! Contact hafizah@cmtsp.com.sg to register and for more details. "Good opportunity for biomass marketing and networking with other companies in the world"
"Basic event to share knowledge and to meet companies that are dealing in the same sector"
"I have learned and informed of the various approach to achieve a proper designed biomass power plant"
Indonesia produces 64 million tons of waste annually. Jakarta itself produces 6,600 to 6,700 tons of garbage per day. The capital city needs at least three waste-to-energy plants – as per 2012- 2023 master plan for garbage management. Currently, Jakarta has only Bantar Gebang waste treatment facility in Bekasi, West Java to treat its waste. Jakarta city administration spends Rp 133,000 (US$9.77) for every ton of waste that is processed at Bantar Gebang. Jakarta is expected to construct intermediate treatment facilities (ITF) to process waste into energy in four areas of the capital. The plants will be located in – Sunter with a capacity to process 1,000 tons of waste per day, Cakung Cilincing (with 1,500 tons per day capacity) and Marunda (capacity for 2,500 tons per day) and another in Duri Kosmabi, West Jakarta. The facilities are expected to use incinerating machines to produce thermal energy. PT Jakarta Propertindo will develop the ITF in Cakung Cilincing and Marunda while ITF in Sunter and Duri Kosambi is said to be developed by the Jakarta Sanitation Agency. Although tenders for the projects were offered in 2012 and foreign companies were selected, no winners are announced yet – due to the change in political leadership. More on ‘Municipal Solid Waste (MSW) to Energy – Techno-Economics For Growth in Indonesia’ will be discussed by Made Wahyu Wiratma, Growth & Strategy Director, Gas Engine, General Electric Company (GE Indonesia) at CMT’s 3rd Biomass & BioEnergy Asia on 27 February- 1 March, 2017 in Jakarta. For more information about the event, contact Ms. Hafizah at hafizah@cmtsp.com.sg or call 65 6346 9218. In a new record, Indonesia has consumed as much as 2 million kiloliters of biodiesel in the period between January and October 2016. The government had introduced biodiesel to stabilize the country’s palm oil prices and also to address climate change. The total consumption of 2.06 kiloliters in the first 9 months of the year translates to almost the monthly requirement of Indonesia. However only about 7 percent of the 33 million tons of crude palm oil produced in 2016 was used to make biofuel. The Indonesian government aims to raise this number to 26 percent by 2020. Already the use of biodiesel has helped Indonesia reduce 4.3 million tons of carbon dioxide from its greenhouse gas emissions this year. Indonesia expects to obtain 23 percent of its energy from mixed and renewable sources, including biofuels and raise this percentage to 30 percent by 2050. The other key South East Asian player – Malaysia is planning to raise the current B7 biodiesel mandate to B10. The biodiesel B10 is a blend of 10 percent palm methyl ester (PME) and 90 percent regular diesel while B7 is of a lower blend of 7 per cent PME. The new measure will also require the industrial sector to start using the B7 blend. The industrial sector has until now been using regular diesel. The new mandate is expected to create demand for 800,000 tonnes of palm oil per year to be converted into PME. The initiative is expected to help Malaysia’s palm oil stocks and support palm oil prices in the international market. The Malaysian government, via the Ministry of Plantation Industries and Commodities and its agency Malaysian Palm Oil Board, has taken a gradual approach in rolling out the B5 and then B7 blends in the country. The country’s biodiesel producers supply PME to the transport sector, starting June 2011 with the B5 programme. Thereafter, the blending percentage was raised to B7 in November 2014. More about biodiesel market developments will be discussed at CMT’s 3rd Biomass & BioEnergy Asia on 27 February- 1 March, 2017 in Jakarta. Bronzeoak, a renewable energy developer, is planning to build 3 biomass plants in Philippines. The company is already building its first biomass plant and expects it to be completed by the second quarter of 2017. The company has secured $141-million funding from IFC for the three plants. The three plants will be located in San Carlos, South Negros and North Negros. The company plans to concentrate on completing the San Carlos plant first and the construction at the other plants will be begin thereafter. The San Carlos plant is undergoing reconfiguration of its boilers from the original capacity of 18 MW to 19.99 MW – which has delayed the project slightly. The redesigning of the boiler will help to fuel the plant with not just pure sugar cane waste (which is expected to be the main feedstock) but also wood chips, coconut husks or even rice husks and napier grass. Bronzeoak has signed an agreement with Wuxi Huaguang Electric Power Engineering to supply the boiler of the biomass projects. Bronzeoak has also completed five solar power projects with a total capacity of 143 MW located in La Carlota City, the municipality of Manapla and San Carlos City. More about biomass power projects in Asia at CMT’s 3rd Biomass & BioEnergy Asia on 27 February- 1 March, 2017 in Jakarta. Indonesia’s annual new and renewable energy target is set at US$1.37 billion – which is expected to be exceed, according to its Energy and Mineral Resources (ESDM) Ministry. The country’s new and renewable energy sector has already received US$867 million at the end of July 2016 – which is 63.5% of the targeted investment amount. Investment realization in bioenergy has already reached 93.2% of US$31 million target. The other new and renewable energy sectors are also performing well with geothermal reaching US$56 million or 58.3% of US$96 million target whereas new renewable energy has seen investments of US$180,000 or 18% of US$1 million target. ESDM is expected to announce revised electricity rate for new renewable energy this year. The revised electricity rate for biomass and biogas was already announced in Ministerial Regulation 21/2016 – with biomass electricity rate increases to Rp1,150 per kWh to US$13.5 cents per kWh or a 60% increase. Moreover, biogas electricity rate from Rp1,050 per kWh to US$10.64 cents per kWh or up by 30%. More about Indonesia’s bioenergy and biogas market developments will be discussed at CMT’s 3rd Biomass & BioEnergy Asia on 27 February- 1 March, 2017 in Jakarta.